I think Meatless Monday is a good idea. It can be something simple or it can get quite elaborate, depending on mood and time. Since Whole Foods came to town, one can choose from a broad array of special items at the olive bar and salad bar to kick up a simple salad. You don’t have to fill the refrigerator will more than you need for one meal. Even the local Albertson’s has added a basic salad bar. Last night, I decided to have a salmon filet roasted with Williams Sonoma Potlatch Seasoning. This is a frequent treat on the grill, but it was windy last night, so I roasted it in the oven. I wanted a salad with the salmon, but what I had in the fridge was some baby arugula, some snacking cucumbers, limp celery and a couple of carrots and green onions. Off to the store I went and picked up artichoke hears and drunken tomatoes at the olive bar. Drunken tomatoes are lightly roasted and marinated in a vinaigrette spike with a splash of red wine. I found more goodies at the cold food bar – roasted baby eggplant with green peppers and onions and a Brussels sprouts and kale salad. I got just enough of the goodies for the salad to make one serving for each of us. – no left overs! I drained the marinade from the drunken tomatoes and added olive oil, and a few pinches of Aleppo pepper with a smudge of whole grain mustard and make a dressing for the salad. I added the bit of Brussels sprouts and kale salad to my arugula and tossed it all with the dressing. 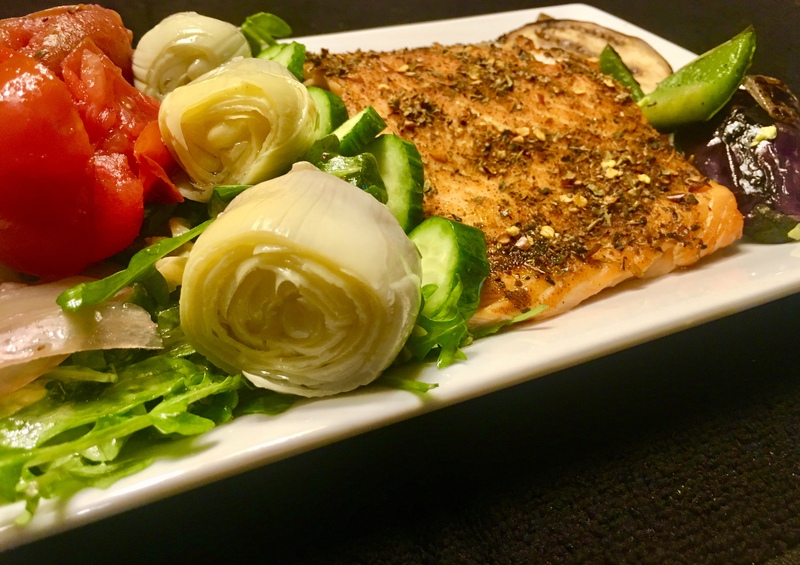 When I plated the salmon, I arranged all the other goodies on the salad and plate and suddenly, the salmon and salad supper sparkled. One word of caution, all the beautiful goodies on the food bars are sold by the pound. Don’t get carried away or you’ll be in for a shock at the register! Roasted salmon and salad enhanced with goodies from the food bars at the store. Meatless Monday at its best. At last, we’re getting some good thick stalked asparagus in the markets. We’ve dealt with too-thin imports for the whole winter. It calls for a special treatment, perhaps asparagus spears wrapped with prosciutto. Simple is good. 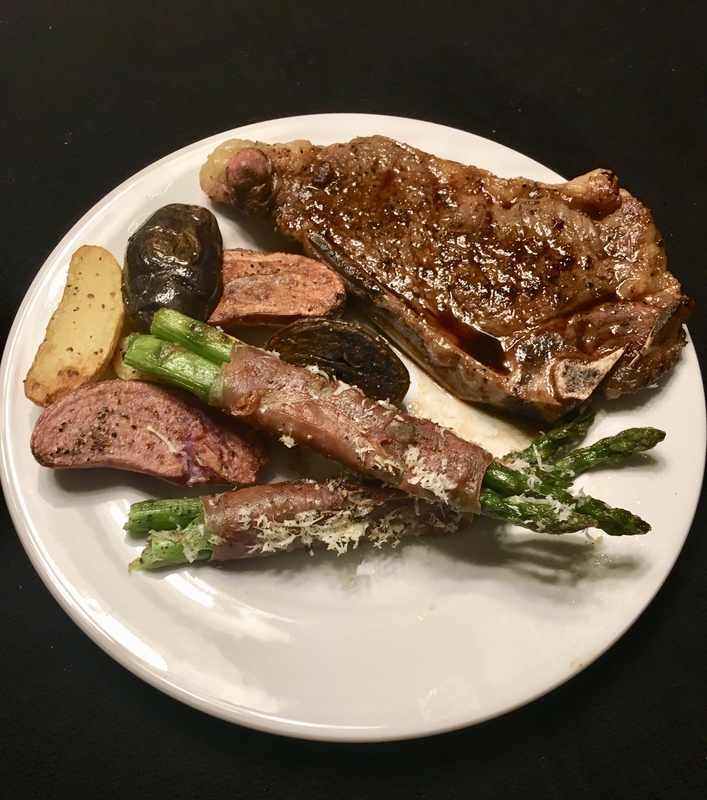 A pan roasted rare, steak, patriotatos (red while and blue potatoes) and thick stemmed asparagus wrapped in prosciutto. Sunday dinner at it’s best! Blanch asparagus in a pot of boiling salted water until crisp-tender and bright green, about three minutes. Transfer asparagus to an ice water bath to stop cooking and pat dry. Wrap three stalks of asparagus in one slice of prosciutto and repeat with remaining asparagus. Melt butter with oil in a skillet over medium high heat. Add asparagus bundles and sauté, turning until prosciutto is crisp, 3-5 minutes. Remove bundles to a plate aside and sprinkle with Romano and pepper. Note: This is a very simple meal. I decided it would be a one pan meal. I first cooked the fingerling potatoes in the sauté pant until they were tender had had a little color. Then I added a tiny bit more olive oil and cooked the asparagus bundles. With three stalks in each bundle, they were triangular; I turned them one side at at time after cooking them for one minute. I then wiped the pan out well with paper towels, returned it to a higher heat and added my two steaks. I turned them at minute intervals until they were nicely browned the gave them a couple of minutes more until the reached an internal temp of 145º. I removed them from the pan and let them rest, tented with foil for about five minutes. They were then a wonderful medium rare. Roasted Asparagus Salad with Bitter Greens because I couldn’t find arugula! Sometimes, the side dish steals the show. 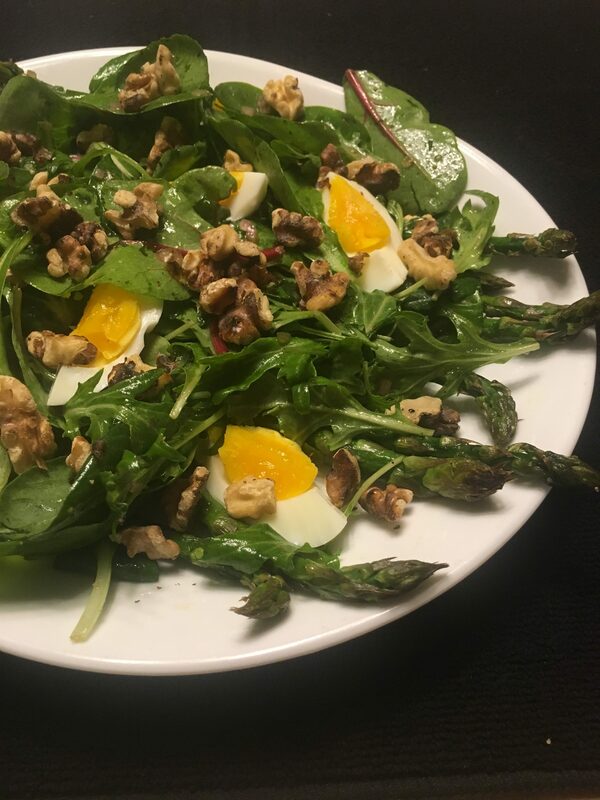 This roasted asparagus salad recipe looked good and sounded better! I had to get mixed greens because I couldn’t find arugula by itself. This one’s I keeper I’ll be making again because, I just happened to have a little asparagus in the crisper from last night! With a salad like this, the challenge was what to do for a main course? Lamb shoulder is always a good choice, especially when roasted with Meyer lemon juice and oregano with a sprinkle of garlic powder. 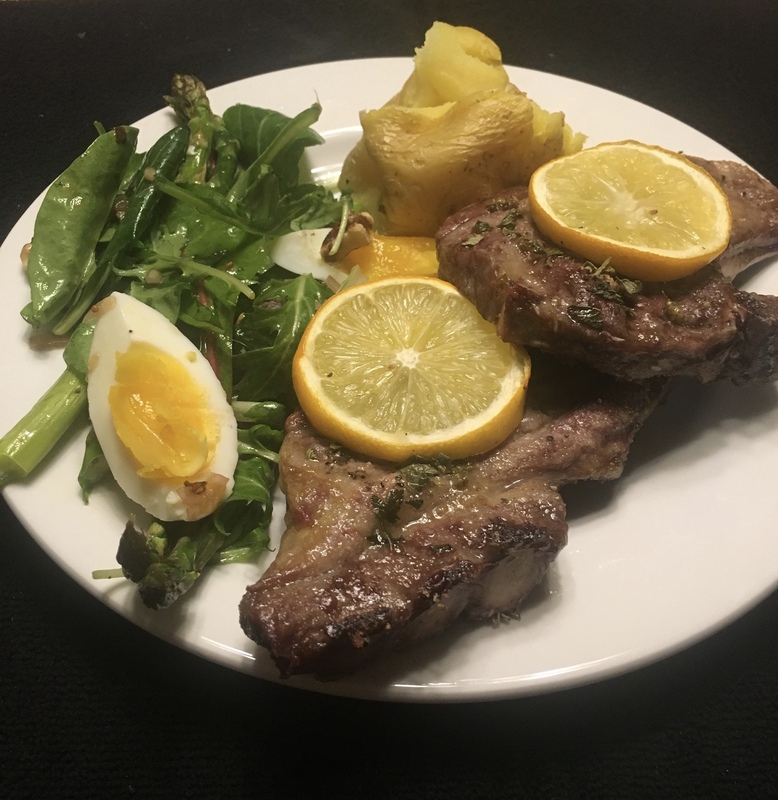 To accompany the salad, lamb shoulder chops with Meyer lemon, oregano and a light sprinkle of garlic powder and a small Yukon Gold potato. Preheat oven to 425°. In a large, shallow baking dish, toss asparagus with olive oil and pinches of salt and pepper until tender – 15 – 20 minutes. Transfer to a platter. In a small bowl, combine diced shallot, vinegar and ¼ tsp sea salt. Let stand a few minutes, then whisk in oil. In a bowl, toss arugula leaves with dressing to coat. Heap over asparagus and tuck in quartered eggs and sprinkle with walnuts. Add more dressing and salt to taste. Who doesn’t love posole in the wintertime? Technically posole is Spanish for hominy. Practically speaking it is the common name for a Mexican soup made with pork or chicken, broth and spices including chile. It is comfort food with a kick! But what if you are vegetarian or vegan? Chile water and hominy doesn’t quite cut it. I came a cross a recipe using butternut squash and hominy in a spicy broth (either chicken broth or vegetable broth) that I wanted to try and, if was good, recommend it to my chile-loving vegetarian daughter. I have to say that even a carnivore like me really enjoyed it and I had two big bowls of the experimental batch. 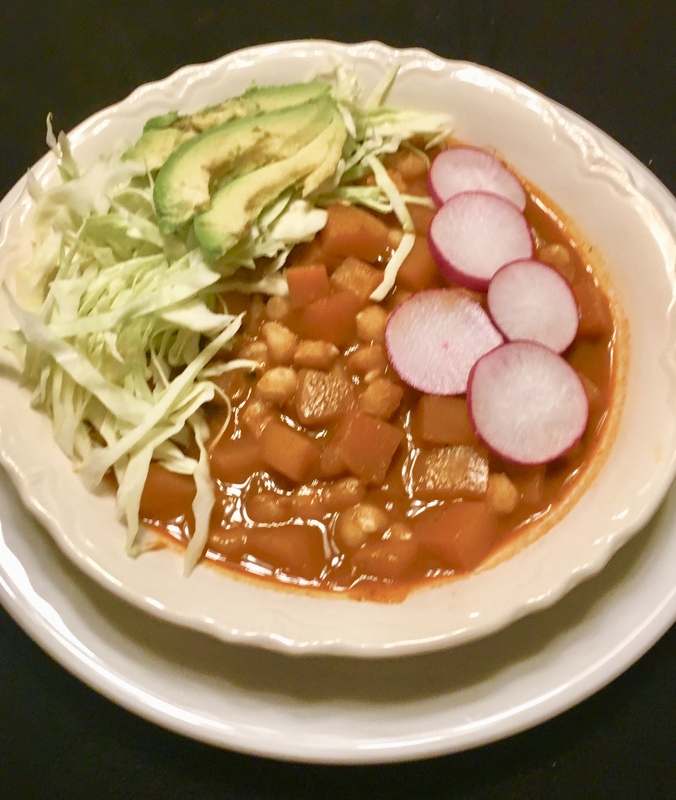 Butternut Squash Posole with traditional garnishes of shredded cabbage, radishes and sliced avocado. There were warm tortillas on the side. Heat oil over medium-high heat in a large, heavy-bottomed pot. Add squash, onion and ¾ tsp. salt. Cook, stirring occasionally until vegetables begin to soften, 7 t0 8 minutes. Add tomato paste, garlic, chili seasoning, cumin and oregano and cook 1 minute, stirring often. Add broth and hominy and bring to a simmer. Simmer uncovered, until squash is tender, 12 to 15 minutes. Season to taste with salt. Spoon into bowls and serve with cabbage, lime, avocado, radishes and a basket of warm tortillas. This is a simple recipe if you do you prep by grouping things that go together ahead of times – seasonings all together, things that can need to be cooked all together and garnishes all together. Don’t let the seemingly long list of ingredients intimidate you. I am vegetarian friendly, but not a vegetarian. I used low-sodum chicken broth because I keep it in my pantry. I put butter on the warm tortillas because i like them that way. A certain food magazine’s cooking without a recipe feature always gets me thinking about what I could do without a recipe. I borrowed their basic idea and name up with my posting category “Play With Your Food.” How’s this for playing with dinner prep? 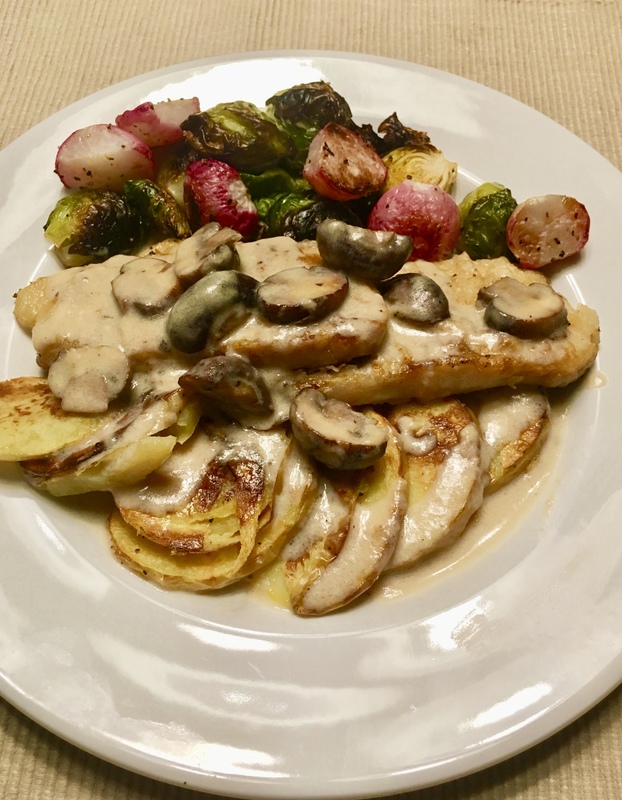 From the top: roasted Brussels sprouts and radishes with pan-browned petit pork loin chops with a mushroom pan sauce and thin-sliced Yukon gold potatoes oven-roasted and sharing a little of the pan sauce. I’ve made a roasted potato and radish salad a few times and have come to enjoy the mellow flavor of roasted radishes. I figured, why not try the radish with the robust flavor of Brussels sprouts. Tossed with olive oil, salt and pepper and roasted in a 400º oven for 15 minutes, then stirred about and back to the oven for 10 minutes made them just right as a colorful and delicious side. The pork chops were dipped in milk and dredged in flour, then browned in a couple of Tbsp canola oil. They were so thin that it took just a couple of minutes to cook four of them. Removing the chops to drain on paper towels I worked on the pan sauce. I put equal parts of fat (pan drippings and butter) and flour in a glass measure. I microwaved it for 20 seconds, then stirred and microwaved it again. Repeating this five or six times cooked the flour and made a nice roux that I thinned with a little milk. Back at the pan, I added a couple pats of butter and cooked the mushrooms until they released their liquor. Next, I added a splash or two of milk and began to add the roux and stir it until the pan sauce was thick, but not too thick. I seem to do better with microwaved roux sometimes than making one in the pan. The potatoes were placed on parchment paper sprayed with non-stick spay. They were roasted beside the sprouts and radishes until it was time to toss the veggies. The potatoes were done by then and removed from the oven and kept warm. They were tender and a few slices picked up a little nice color while roasting. This was actually a very simple meal to prepare and the prep was easy. I played with the sprouts and radishes and with the pan sauce and make something good!